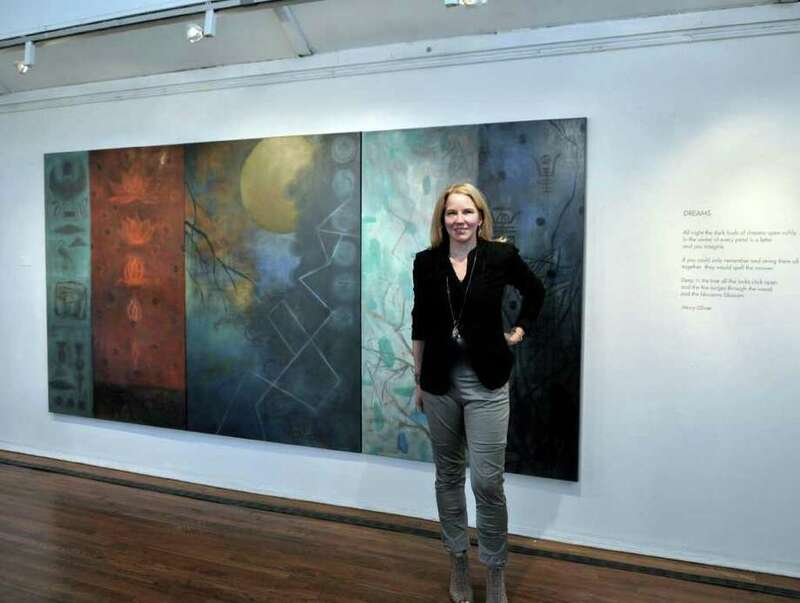 Artist Stephanie Joyce stands with her artwork at Silvermine. New Canaan resident Stephanie Joyce will exhibit her work at Silvermine Arts Center through April 22. There will be an artist's talk April 17 at 6 p.m. According to Joyce, "In this body of work there is an exploration of the subconscious through dream analysis and journaling. Ancient symbols are layered with elements of nature to evoke harmony and a unity of cultures in the unfolding of the year 2012." Silvermine is at 1037 Silvermine Road in New Canaan. Gallery hours are Wednesday through Saturday, noon to 5 p.m. and Sunday 1 to 5 p.m. Visit www.silvermineart.org or www.stephaniejoyce.com.